The business-client relationship is a complex one. Sometimes, the power is on the side of your small business, but the next time you might find yourself groveling for a sale. It’s a fairly normal give and take in the business world, but the real potential for danger comes when you try to give your most value clients promotional giveaways as a gesture of your goodwill. SmallBizTrends.com explained that everything from the price of the gift to the sensitivities regarding religion might rub your clients the wrong way even though you might have had good intentions. Still, when you find the right gift for the right client, it can be the final link in the chain that binds business and consumer together for a long and fruitful partnership for years to come. This doesn’t have anything to do with the size of the gifts you plan to give, but rather the number of people you choose to put on your list. Fox Business explained that if you have the time and resources, sending all of your clients personalized products can be a great way to boost your brand’s image. However, if you have too many clients for that to be a feasible plan, the source also recommended identifying a handful of your top customers and spending big on them instead. 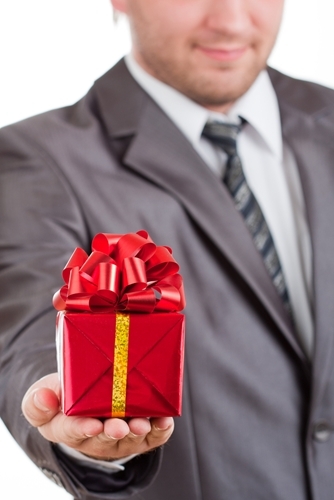 When you’re giving gifts to your friends, it really is the thought that counts, but your clients aren’t likely to be so forgiving if you send them a dud of a gift to mark a business deal or as a show of thanks. In an interview with American Express, Cassie Kreitner, editor of thegift.com, explained that personalized products really do make a difference to clients. If that sounds like it might be a good fit for your clients, look into products like Myron’s Da Vinci Infinito Red Wine Glasses. Not only can you add your own custom engraved image to the glasses themselves, but they also come in a stylish gift box that is sure to impress even your stingiest client. If your clients are expecting a gift from you, they’re probably thinking it’s going to be some kind of promotional giveaway or similar tangible product. If you’re buying for the man or woman who already has everything, Kabbag.com recommended buying mail-order services that keep on giving. If you know you have some foodies you need to send thank-you gifts, look into Naturebox, a company that sends personalized, healthy snacks straight to your door. If you’re looking to buy for clients who are more into fashion, Birchbox uses the same idea, but fills their containers with a monthly rotation of popular cosmetic products. The source explained that these gifts are great on two fronts. First, they’re spread out over several months instead of one single time, so your clients might feel like you’re still taking care of them long after you gave them the subscription. Also, most of these companies charge by the month, so you can pay in installments rather than breaking the bank with one big lump sum. As long as you put some effort into the gift, no client is going to think your present was inappropriate. However, if you follow these tips, you just might make a customer for life.